This story is been long overdue. Last year I photographed wedding at Greywalls Hotel, but felt that I didn’t manage to explore many of possibilities there. Sometimes this happens due to shortage of time, weather and I love going back and see if I can scoop up more ideas to show my potential wedding couples. Alison and John I have known for a while now. It is been my honour to photograph their daughter Elicia since newborn age. Fantastic family and fun little girl they have. During my Day in Life projects with them we got to talk about their wedding. I listened to their story, we looked at some images. It looked fine, but I felt that they didn’t get that wow factor about their images. I felt that this would be perfect timing to visit Greywalls Hotel and do more exploring with awesome couple. I could easily use models to go there, but problem is that models don’t have that chemistry what married couple would. To couple this almost would feel like renew wows. They joke with each other and relive those nice love moments. Rediscover. 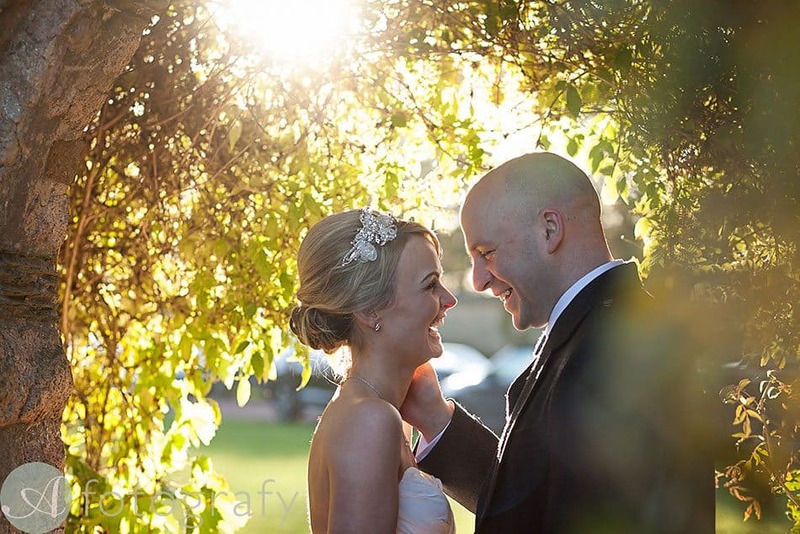 It was amazingly warm autumn day, beautiful light and very keen married couple. They laughed, smiled and had time of their life. John loves to tease Alison and I loved to document that. As a result I have fantastic set of shots and they have beautiful images to decorate walls with. Plus something what they could add to that wedding album and pass onto generations. Everyone dreams about having beautiful, romantic photos of their wedding day. We met our photographer a year after our wedding when we were having Elicia’s newborn photoshoot taken. We knew straight away from his unquestionable talent & his fun, bubbly charm that we had really missed out not meeting him a year earlier. Our wedding day itself was perfect but like all weddings it rushed past in a blur. We didn’t really quite understand the importance in what the right photographer could bring to the day until it was too late. But it turns out it’s never too late! I got my wedding dress out of storage & John put his kilt on and we headed off to Greywalls and Gullane beach for our second wedding shoot with Armands. Well, what girl wouldn’t want to wear her wedding dress again?! It might sound odd to some people but it was simply two happy people, in love on a very special day. We were able to relive the magic of our wedding day with an incredibly fun and creative photographer. I don’t think we’ve ever laughed so much in one day before! There was no rush, it was relaxed and just so much fun. It was all about us and Armands made us feel so comfortable we were able to just be ourselves. Armands had such creative ideas it felt truly unique. It was like being on an adventure! When we look back through our photos we feel like we’re back in that moment and we feel so lucky that we have these memories to treasure forever. We really feel each picture captures the beauty, love and fun from the day. From feeling so carefree running along the beach together against the stunning backdrop to sharing a special moment in the enchanting gardens at Greywalls, we really couldn’t ask for more. We had always dreamed about sharing our photos with Elicia one day and talking about our dreamy, romantic fairytale. Armands has turned this into a reality for us. We will never forget this magical day and will be forever grateful for the memories captured through our stunning photos. Enjoy this beautiful selection of their after wedding portraits. Thank you Alison and John. I look forward to keep documenting your family milestones. Hugs to you guys. Call studio on 07850209999 to find out if I’m available for your date or email to hello@a-fotografy.co.uk. Looking for a wedding photographer? Check this little guide I made for couples who are not sure what to expect or ask their wedding photographer. Should give you plenty of information to start with.